I have been a fan of the Milanese-style coffee shop, Sant Ambroeus, for as long as I can remember; first in Manhattan, then in the Hamptons, and most recently the new outpost in Palm Beach. Come summer, the cafe’s outdoor garden in Southampton is a lovely spot for lunch. 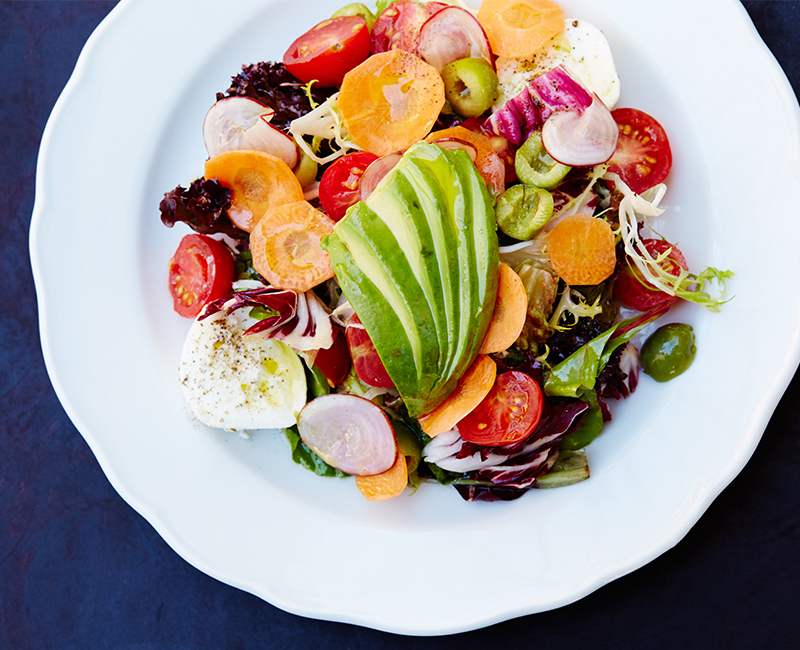 I often order the Insalata Centocolori, a delicious salad that is perfect for summer entertaining. I recreate it at home, served on AERIN x Williams Sonoma blue floral and white scalloped plates, alongside a pitcher of iced tea for a refreshing alfresco lunch. Sant Ambroeus House Dressing: Combine Dijon mustard, white vinegar, and salt in a small bowl. Whisk until combined. Slowly add olive oil, whisking briskly. Set aside. Hand cut radicchio, frisée, and lolla rossa into large leaves. Wash lettuce three times and spin dry. Wash cherry tomatoes and carrots. Cut cherry tomatoes and olives in half. Thinly slice the carrot. Cut avocado in half, pit, and thinly slice. Slice buffalo mozzarella into ¼ inch thick rounds. Place lettuce, tomatoes, carrots, and olives in a large bowl. Add house dressing and toss gently to thoroughly coat. Plate salad and top with sliced avocado and buffalo mozzarella. For more recipe ideas for outdoor entertaining this summer, see Holly Peterson’s recommendations, as well as CEO of Sotheby’s Wines, Jamie Ritchie’s perfect wines for summer.